FAO AGROVOC team takes this opportunity to inform you about the FAO AGROVOC December 2018 release. Starting April 2017, the FAO AGROVOC multilingual thesaurus has been updated on a monthly basis (see all AGROVOC releases). Browse AGROVOC with SKOSMOS! We want AGROVOC to be useful and relevant for Your work! covering (in up to 30 languages!) topics related to food, nutrition, agriculture, fisheries, forestry, environment and related sectors. Please note that in case you have an AGROVOC test account, agrovoc-test has just been populated with December release data. 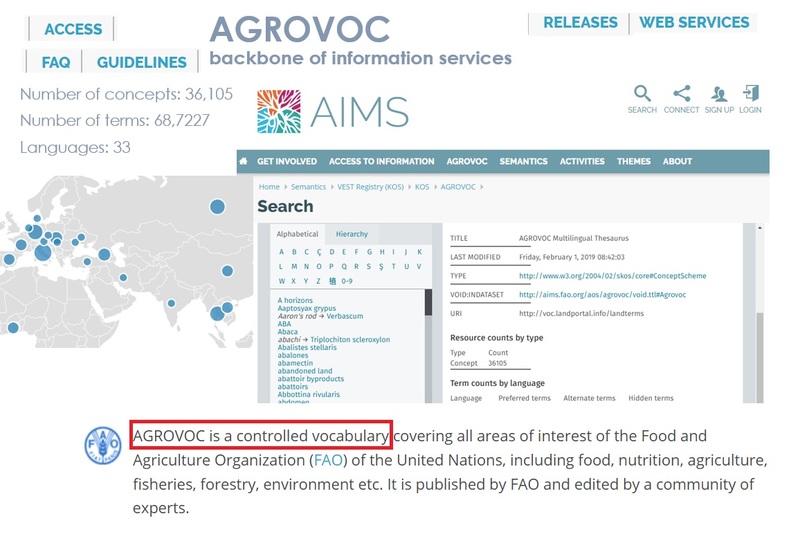 If you ever need to suggest a new concept and are not an AGROVOC Editor, please remember that you can also do it by email to agrovoc@fao.org. Please send the suggested new concept in English, with any translations available, suggested broader term if possible, and the definition with source (the more information, the better!). It will then be reviewed. We want AGROVOC concepts/terms to be useful and relevant for Your work!